← Can Fish Food Attract Bears? Answer: Archery hunting from boats on Lake Shasta is a common practice and perfectly legal provided certain rules are followed. 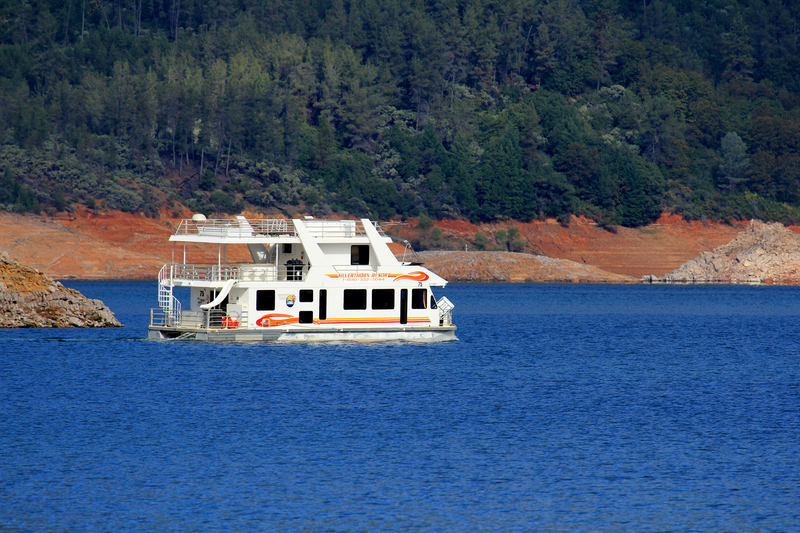 The lake is managed by the U.S. Forest Service and no hunting is allowed around boat ramps, marinas or campgrounds. Houseboats are considered dwellings (per FGC, section 3004), so hunting and discharging a firearm or bow within 150 yards is prohibited unless the hunters have specific permission from the boat’s occupants in advance. Hunting from boats is legal as long as when shooting the boat is not moving under the power or influence of a motor or sails (California Code of Regulations Title 14, section 251(a)(1)). Feeding deer and all big game is illegal, and this includes tossing out fruits and salad scraps for the deer (CCR Title 14, section 251.3). I you see any of this activity going on, please call 1-888-DFG–CALTIP to report violations. Answer: If you review sections 2.00-2.45 in both the freshwater and ocean sport fishing regulation books, you will find the approved methods of take for harvesting fish, and using a dog is not a listed legal option (California Code of Regulations Title 14, sections 2.00– 2.45). Question: My hunting partner has been very assiduous in accumulating points toward a cow elk hunt and estimates that he has two chances in three this year of getting a tag. He invited me along to help cut up the carcass and to share the meat. My question is can I can bring a rifle in case a finishing shot is needed? We would only tag one elk in any case, and naturally my hunting partner would get the first shot. He’s a pretty good shot so I expect the animal to go down quickly. I’m just wondering (Walter M., Lakewood). Answer: Leave your rifle at home unless you have a tag. The only person authorized to take or assist in taking the elk is the person with the tag. Residency requirements to buy a fishing license? Answer: California law is clear on the definition of a “resident.” A resident is defined as any person who has resided continuously in California for six months or more immediately before the date of application for a license, or persons on active military duty with the armed forces of the United States or an auxiliary branch or Job Corps enrollees. If you are not a California resident by this definition, you cannot purchase a California resident license. However, if you have an Arizona fishing license with Colorado River Special Use Stamp affixed to it, you may take fish from a boat or other floating device on the Colorado River or adjacent waters that form the California-Arizona border. Carrie Wilson is a marine environmental scientist with the California Department of Fish and Wildlife. While she cannot personally answer everyone’s questions, she will select a few to answer each week in this column. Please contact her at Cal.Outdoors@wildlife.ca.gov. This entry was posted in Archery, Bait, Big Game, Deer Hunting, Dog Training, Elk, Fish and Game Code, Licensing/Permits/Stamps/Report Cards, Methods Of Take, Methods Of Take, Pets, Title 14, Uncategorized and tagged archery, Deer, dog training, freshwater fishing, Licenses. Bookmark the permalink.